The Battle of Warsaw (sometimes referred to as the Miracle at the Vistula, Polish: Cud nad Wisłą) was the decisive battle of the Polish-Soviet War, which began soon after the end of World War I in 1918 and concluded with the Treaty of Riga (1921). The Battle of Warsaw was fought from 13 to 25 August 1920 as Red Army forces commanded by Mikhail Tukhachevsky approached the Polish capital of Warsaw and nearby Modlin Fortress. On August 16, Polish forces commanded by Józef Piłsudski counter-attacked from the south, forcing the Russian forces into a disorganized withdrawal eastward and behind the Niemen River. Estimated Bolshevik losses were 10,000 killed, 500 missing, 10,000 wounded and 66,000 taken prisoner, compared with Polish losses of some 4,500 killed, 10,000 missing and 22,000 wounded. Before the Polish victory at the Vistula, both the Bolsheviks and the majority of foreign experts considered Poland to be on the verge of defeat. The stunning, unexpected Polish victory crippled the Bolshevik forces. In the following months, several more Polish victories secured Poland's independence and eastern borders, and help to thwart Soviet ambitions to quickly realize the world revolution that their theory had predicted. The Poles were fighting to preserve their newly regained independence, lost in the 1795 third partition of the Polish-Lithuanian Commonwealth, and to carve out the borders of a new multinational federation (Międzymorze) from the territories of their former partitioners–Russia, Germany and Austria-Hungary. By 1919 the Bolsheviks had gained the upper hand in the Russian Civil War, having dealt crippling blows to the White Russians. Vladimir Lenin viewed Poland as a bridge that had to be crossed so that communism could be brought to Central and Western Europe, and the Polish-Bolshevik War seemed the perfect way to test Bolshevik strength. Bolshevik speeches asserted that the revolution was to be carried to western Europe on the bayonets of Soviet солдаты (soldatyi or soldiers) with the shortest route to Berlin and Paris lay through Warsaw. After early setbacks against Poland in 1919, the Bolshevik offensive that eclipsed the Polish Kiev Operation began in early 1920 and had been overwhelmingly successful. By mid-1920, Poland's very survival was at stake and the entire world expected Poland to collapse at any moment. The Soviet strategy called for a massed push toward the Polish capital, Warsaw. Its capture would have had a tremendous propaganda effect for the Soviets, who expected it not only to undermine the morale of the Poles, but to spark an international series of communist uprisings and clear the way for the Red Army to join the German Revolution. The Soviet 1st Cavalry Army under Semyon Budyonny broke through Polish lines in early June 1920. This led to a collapse of all Polish fronts in the east. On July 4, 1920, Mikhail Tukhachevsky's Western Front began an all-out assault in Belarus from the Berezina River, forcing Polish forces to retreat. On July 19 the Red Army seized Grodno, on July 28, it reached Białystok, and three days later, the Brześć Fortress was captured. By the beginning of August, the Polish retreat had become more organized. 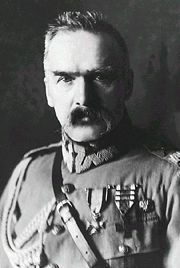 At first, Józef Piłsudski wanted to base his operation on the Bug River and Brest-Litovsk, but their unexpected fall made it impossible. On the night of August 5—6, Piłsudski conceived a revised plan at the Belweder Palace in Warsaw. It called in the first phase for Polish forces to withdraw across the Vistula River and defend the bridgeheads at Warsaw and at the Wieprz River. Some 25 percent of the available divisions would be concentrated to the south for a strategic counteroffensive. Next, Piłsudski's plan called for the 1st and 2nd Armies of Gen. Józef Haller's Central Front (10 1/2 divisions) to take a passive role, facing the Soviet frontal attack on Warsaw from the east and holding their entrenched positions at all costs. At the same time, the 5th Army (5 1/2 divisions) under Gen. Władysław Sikorski, subordinate to Gen. Haller, would defend the northern area near the Modlin Fortress and, when it became feasible, strike from behind Warsaw, thus cutting off Soviet forces attempting to envelop Warsaw from that direction, and break through the enemy front and fall upon the rear of the Soviet Northwestern Front. An additional five divisions of the 5th Army were to defend Warsaw from the north. General Franciszek Latinik's 1st Army would defend Warsaw itself, while General Bolesław Roja's 2nd Army was to hold the Vistula River line from Góra Kalwaria to Dęblin. The most important role, however, was assigned to a relatively small (some 20,000-man), newly assembled "Reserve Army" (also called the "Assault Group" - Grupa Uderzeniowa), commanded personally by Józef Piłsudski, comprising the most battle-hardened and determined Polish units drawn from the southern front. They were to be reinforced by General Leonard Skierski's 4th Army and General Zygmunt Zieliński's 3rd Army, which, after retreating from the Western Bug River area, had moved not directly toward Warsaw but had crossed the Wieprz River and broken off contact with their pursuers. The Assault Group's assignment was to spearhead a lightning northern offensive from the Vistula-Wieprz River triangle south of Warsaw, through a weak spot identified by Polish intelligence between the Soviet Western and Southwestern Fronts. This would separate the Soviet Western Front from its reserves and disorganize its movements. 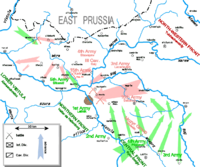 Eventually the gap between Gen. Sikorski's 5th Army and the advancing Assault Group would close near the East Prussian border, leaving the Soviet offensive "trapped in a sack." Although based on fairly reliable information provided by Polish intelligence and intercepted Soviet radio communications, the plan was labelled as 'amateurish' by many high-ranking army officers and military experts, who were quick to point out Piłsudski's lack of formal military education. Many Polish units, a mere week before the planned date of the counter-attack, were fighting in places as far as 100–150 miles (150 to 250 km) from the concentration points. All of the troop movements were within striking distance of the Red Army. One strong push by the Red Army could derail plans for a Polish counter-attack and endanger the cohesion of the whole Polish front. Piłsudski's plan was strongly criticized by Polish commanders and officers of the French Military Mission. Even Piłsudski himself admitted in his memoirs that it was a very risky gamble and the reasons he decided to go forward with the plan were the defeatist mood of politicians, fear for the safety of the capital and the prevailing feeling that if Warsaw were to fall, all would be lost. Only the desperate situation persuaded other army commanders to go along with it, as they realized that under such circumstances it was the only possible way to avoid a devastating defeat. Ironically, when a copy of the plan accidentally fell into Soviet hands it was considered to be a poor deception attempt and ignored. A few days later, the Soviets paid dearly for this mistake. There is some controversy as to the authorship of the plan. Due to Piłsudski's political image, he was largely unpopular with the right wing of Polish politics. After the battle many journalists suggested that the plan was in fact prepared either by Maxime Weygand or by Chief of Staff Tadeusz Rozwadowski. According to recent research, the French Military Mission to Poland proposed only a minor tactical counter-attack of two divisions towards Mińsk Mazowiecki. Its aim would have been to push the Bolshevik forces 30 kilometers back in order to ease subsequent ceasefire negotiations. 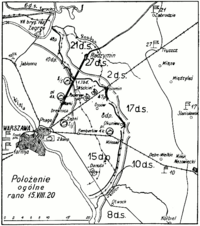 On the other hand, Gen. Rozwadowski's plan called for a deeper thrust into Russian lines from the area of Wieprz. Piłsudski proposed a large scale operation, with significant forces committed to beating the enemy forces rather than merely pushing them back. The plan was opposed by the French mission, which did not believe that the Polish Army would be able to regroup after a 600 kilometer retreat. Nonetheless for many years the perception persisted that it was the timely arrival of Allied forces that had saved Poland, a version in which Weygand occupied the central role. Mikhail Tukhachevsky planned to encircle and surround Warsaw by crossing the Vistula river, near Włocławek to the north and south of the city and launch an attack from the northwest. With his 24 divisions, he planned to repeat the classic maneuver of Ivan Paskievich, who in 1831, during the November Uprising, had crossed the Vistula at Toruń–reaching Warsaw practically unopposed. This move would also cut the Polish forces off from Gdańsk, the only port open to shipments of arms and supplies. The main weakness of the Soviet plan was the poorly defended southern flank, secured only by the Pinsk Marshes and the weak Mozyr Group; the majority of the Soviet Southwest Front was engaged in the battle of Lwów (1920). Meanwhile the Bolsheviks pushed forward. Gay Dimitrievich Gay's Cavalry Corps together with the 4th Army crossed the Wkra river and advanced towards the town of Włocławek. The 15th and 3rd Armies were approaching Modlin fortress and the 16th Army moved towards Warsaw. The final Soviet assault on Warsaw began on August 12 with the Soviet 16th Army commencing the attack at the town of Radzymin (only 23 kilometers east of the city). Its initial success prompted Piłsudski to move up his plans by 24 hours. Positions prior to the battle. 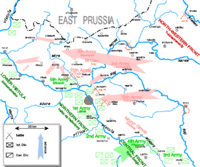 The first phase of the battle started on August 13, with a Red Army frontal assault on the Praga bridgehead. In heavy fighting, Radzymin changed hands several times and foreign diplomats, with the exception of British and Vatican ambassadors, hastily left Warsaw. On August 14, Radzymin fell to the Red Army, and the lines of Gen. Władysław Sikorski's Polish 5th Army were broken. The 5th Army had to fight three Soviet armies at once: the 3rd, 4th and 15th. The Modlin sector was reinforced with reserves (the Siberian Brigade, and Gen. Franciszek Krajowski's fresh 18th Infantry Division–both elite, battle-tested units), and the 5th Army held out until dawn. The situation was saved around midnight when the 203rd Uhlan Regiment managed to break through the Bolshevik lines and destroy the radio station of A.D. Shuvayev's Soviet 4th Army. The latter unit had only one remaining radio station fixed on one frequency which was known to the Polish intelligence. Since the Polish code-breakers did not want the Bolsheviks to find out that their codes were broken, but still neutralize the other radio station, the radio station in Warsaw recited the Book of Genesis in Polish and Latin on the frequency used by the 4th Army, which thus lost contact with its headquarters and continued marching toward Toruń and Płock, unaware of Tukhachevsky's order to turn south. The raid by the 203rd Uhlans is sometimes referred to as "the Miracle of Ciechanów." At the same time, the Polish 1st Army under Gen. Franciszek Latinik resisted a Red Army direct assault on Warsaw by six rifle divisions. The struggle for control of Radzymin forced Gen. Józef Haller, commander of the Polish Northern Front, to start the 5th Army's counterattack earlier than planned. During this time, Piłsudski was finishing his plans for the counter-offensive. He decided to personally supervise the attack and, because of the enormous risks involved, he handed in a letter with his resignation from all state functions. Thereafter, between August 13 and August 15, he visited all units of the 4th Army concentrating near Puławy, about 100 kilometers south of Warsaw. He tried to raise morale, since many soldiers were tired and demoralized and numerous recently incorporated replacements showed everyone the extent of Polish losses. Logistics were a nightmare, as the Polish army was equipped with guns made in five countries and rifles manufactured in six, each of them using different ammunition. Adding to the problem was the fact that the equipment was in poor shape. Piłsudski remembers: "In 21 Division, almost half of the soldiers paraded in front of me barefoot." Nevertheless, in only three days, Piłsudski was able to raise the morale of his troops and motivate them for one of their greatest efforts. The 27th Infantry Division of the Red Army managed to reach the village of Izabelin, 13 kilometers from the capital, but this was the closest that Russian forces would come. Soon the tides of battle would change. Positions around Warsaw, early morning on August 15. 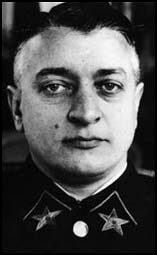 Tukhachevsky, certain that all was going according to plan, was actually falling into Piłsudski's trap. The Russian march across the Vistula in the north was striking into an operational vacuum, where there was no sizeable group of Polish troops. On the other hand, south of Warsaw, Tukhachevsky left only token forces to guard the vital link between the North-Western and South-Western Fronts. The Mozyr Group, which was assigned this task, numbered only 8,000 soldiers. Another error neutralized the 1st Cavalry Army of Semyon Budyonny, a unit much feared by Piłsudski and other Polish commanders. Soviet High Command, at Tukhachevsky's insistence, ordered the 1st Cavalry Army to march toward Warsaw from the south. Semyon Budyonny did not obey this order due to a grudge between commanding South-Western Front generals Aleksandr Yegorov and Tukhachevsky. In addition, the political games of Joseph Stalin, at the time the chief political commissar of the South-Western Front, further contributed to Yegorov's and Budyonny's disobedience. Stalin, in search of personal glory, wanted to capture the besieged industrial center of Lwów. 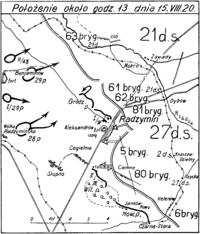 Ultimately, Budyonny's forces marched on Lwow instead of Warsaw and thus missed the battle. Second phase of the battle: Polish counterattack. Heavy fighting for Radzymin, 13:00 hours, August 15. The Polish 5th Army counter-attacked on August 14, crossing the Wkra River. It faced the combined forces of the Soviet 3rd and 15th Armies (both numerically and technically superior). The struggle at Nasielsk lasted until August 15 and resulted in the almost complete destruction of the town. However, the Soviet advance toward Warsaw and Modlin was halted at the end of August 15 and on that day Polish forces recaptured Radzymin, which boosted the Polish morale. From that moment on, Gen. Sikorski's 5th Army pushed exhausted Soviet units away from Warsaw, in an almost blitzkrieg-like operation. Sikorski's units, supported by the majority of the small number of Polish tanks, armored cars and artillery of the two armored trains, advanced at the speed of 30 kilometers a day, soon destroying any Soviet hopes for completing their "enveloping" manoeuvre in the north. On August 16, the Polish Reserve Army commanded by Józef Piłsudski began its march north from the Wieprz River. It faced the Mozyr Group, a Soviet corps that had defeated the Poles during the Kiev operation several months earlier. However, during its pursuit of the retreating Polish armies, the Mozyr Group had lost most of its forces and been reduced to a mere two divisions covering a 150-kilometer front-line on the left flank of the Soviet 16th Army. On the first day of the counter-offensive, only one of the five Polish divisions reported any sort of opposition, while the remaining four, supported by a cavalry brigade, managed to push north 45 kilometers unopposed. When evening fell, the town of Włodawa had been liberated, and the communication and supply lines of the Soviet 16th Army had been cut. Even Piłsudski was surprised by the extent of these early successes. Reserve Army units covered about 70 kilometers in 36 hours, splitting the Soviet offensive and meeting virtually no resistance. The Mozyr Group consisted solely of the 57th Infantry Division, which had been beaten in the first day of the operation. Consequently, the Polish armies found a huge gap between the Russian fronts and exploited it, continuing their northward offensive with two armies following and falling on the surprised and confused enemy. On August 18, Mikhail Tukhachevsky, in his headquarters in Minsk some 300 miles (500 km) east of Warsaw, became fully aware of the extent of his defeat and ordered the remnants of his forces to retreat and regroup. His intention was to straighten the front line, stop the Polish attack and to regain the initiative, but the orders either arrived too late or failed to arrive at all. Soviet General Gay's 3rd Cavalry Corps continued to advance toward Pomerania, its lines endangered by the Polish 5th Army, which had finally managed to push back the Bolshevik armies and gone over in pursuit. The Polish 1st Division of the Legion, in order to cut the enemy's retreat, made a remarkable march from Lubartów to Białystok - 163 miles (262 km) in 6 days. The soldiers fought in two battles, slept only a few hours and marched for up to 21 hours a day. Their sacrifice and endurance was rewarded when the entire 16th Soviet Army was cut off at Białystok and most of its troops taken prisoner. The Soviet armies in the center of the front fell into chaos. Some divisions continued to fight their way toward Warsaw, while others turned to retreat, lost their cohesion and panicked. The Russian commander-in-chief lost contact with most of his forces, and all Soviet plans were thrown into disorder. Only the 15th Army remained an organized force and tried to obey Tukhachevsky's orders, shielding the withdrawal of the westernmost extended 4th Army. But it was defeated twice on August 19 and 20th and joined the general rout of the Red Army's North-Western Front. Tukhachevsky had no choice but to order a full retreat toward the Western Bug River. By August 21, all organized resistance ceased to exist and by August 31, the Soviet South-Western Front was completely routed. Although Poland managed to achieve victory and push back the Russians, Piłsudski's plan to outmaneuver and surround the Red Army did not succeed completely. Four Soviet armies began to march toward Warsaw on July 4 in the framework of the North-Western Front. By the end of August, the 4th and 15th Armies were defeated in the field, their remnants crossed the Prussian border and were disarmed. Nevertheless, these troops were soon released and fought against Poland again. The 3rd Army retreated east so quickly that Polish troops could not catch up with them; consequently, this army sustained the fewest losses. The 16th Army disintegrated at Białystok and most of its soldiers became prisoners of war. The majority of Gay's 3rd Cavalry Corps were forced across the German border and were temporarily interned in East Prussia. Polish soldiers displaying captured Soviet battle standards. Soviet losses were about 15,000 dead, 500 missing, 10,000 wounded and 65,000 captured, compared to Polish losses of approximately 4,500 killed, 22,000 wounded and 10,000 missing. Between 25,000 and 30,000 Soviet troops managed to reach the borders of Germany. After crossing into East Prussia, they were briefly interned, then allowed to leave with their arms and equipment. Poland captured about 231 pieces of artillery and 1,023 machine-guns. The southern arm of the Red Army's forces had been routed and no longer posed a threat to the Poles. Semyon Budyonny's 1st Cavalry Army besieging Lwów had been defeated at the Battle of Komarów (August 31, 1920) and the Battle of Hrubieszów. By mid-October, the Polish Army had reached the Tarnopol-Dubno-Minsk-Drisa line. Tukhachevsky managed to reorganize the eastward-retreating forces and in September established a new defensive line near Grodno. In order to break it, the Polish Army fought the Battle of the Niemen River (September 15–21), once again defeating the Bolshevik armies. After the Battle of the Szczara River, both sides were exhausted and on October 12, under heavy pressure from France and Britain, a cease-fire was signed. By October 18, the fighting was over, and on March 18, 1921, the Treaty of Riga was signed, ending hostilities. Soviet propaganda before the Battle of Warsaw had described the fall of Poland's capital as imminent, and the anticipated fall of Warsaw was to be a signal for the start of a large-scale communist revolutions in Poland, Germany and other European countries, economically devastated by the First World War. The Soviet defeat was therefore considered a setback for some Soviet officials (particularly Vladimir Lenin). A National Democrat Sejm deputy, Stanisław Stroński, coined the phrase, "Miracle at the Wisła" (Polish: "Cud nad Wisłą"), to underline his disapproval of Piłsudski's "Ukrainian adventure." Stroński's phrase was adopted with approval by some patriotically- or piously-minded Poles unaware of Stroński's ironic intent. According to documents found in 2005 at Poland's Central Military Archives, Polish cryptologists broke intercepted Russian ciphers as early as September 1919. At least some of the Polish victories, not only the Battle of Warsaw but throughout the campaign, are attributable to this. Lieutenant Jan Kowalewski, credited with the original breakthrough, received the order of Virtuti Militari in 1921. Graves of Polish soldiers fallen at the Battle of Warsaw, Powązki Cemetery, Warsaw. ↑ 1.00 1.01 1.02 1.03 1.04 1.05 1.06 1.07 1.08 1.09 1.10 1.11 1.12 1.13 1.14 1.15 (Polish)Janusz Szczepański, KONTROWERSJE WOKÓŁ BITWY WARSZAWSKIEJ 1920 ROKU (Controversies surrounding the Battle of Warsaw in 1920). Mówią Wieki, online version. ↑ Soviet casualties refer to all the Warsaw-related operations, from the fighting on the approaches to Warsaw, through the counteroffensive, to the battles of Białystok and Osowiec, while the estimate of Bolshevik strength may be only for the units that were close to Warsaw, not counting the units held in reserve that took part in the later battles. ↑ 3.0 3.1 John J. Mearsheimer. The Tragedy of Great Power Politics. (New York: W. W. Norton & Company, 2001, ISBN 0393020258), 194Google Print, p.194 google books.com. Retrieved June 30, 2008. ↑ 6.00 6.01 6.02 6.03 6.04 6.05 6.06 6.07 6.08 6.09 6.10 6.11 6.12 6.13 6.14 6.15 6.16 Battle Of Warsaw 1920 by Witold Lawrynowicz; A detailed write-up, with bibliography. Polish Militaria Collectors Association. hetmanusa.com. accessed on 5 November 2006. ↑ 8.0 8.1 (Polish) Paweł Wroński. "Sensacyjne odkrycie: Nie było cudu nad Wisłą". ("A Remarkable Discovery: There Was No Miracle at the Vistula"), Gazeta Wyborcza, online. ↑ Anna M. Cienciala, 2004. THE REBIRTH OF POLAND. University of Kansas, lecture notes. accessed on 2 June 2006. ↑ 16.0 16.1 16.2 (Polish) Wojna polsko-bolszewicka. Entry at Internetowa encyklopedia PWN. accessed on 27 October 2006. ↑ (English) Janusz Cisek. Kosciuszko, We Are Here! : American Pilots of the Kosciuszko Squadron in Defense of Poland, 1919–1921. (Jefferson, NC: McFarland & Company, 2002 ISBN 0786412402), 141  Retrieved June 30, 2008. D'Abernon, Edgar Vincent. The Eighteenth Decisive Battle of the World: Warsaw, 1920. New York: Hyperion Press, 1977, ISBN 0883554291. Davies, Norman. White Eagle, Red Star: the Polish-Soviet War, 1919–20. Pimlico, 2003, ISBN 0712606947. Fuller, J.F.C.. The Decisive Battles of the Western World and Their Influence Upon History. (Decisive Battles) (original 1956) Weidenfeld Military; 2 Rev Ed., 2001. ISBN 0304358681. Lukowski, Jerzy and Hubert Zawadzki. A Concise History of Poland. Cambridge University Press, 2006. ISBN 0521559170. Mearsheimer, John J. The Tragedy of Great Power Politics. New York: W. W. Norton & Company, 2001, ISBN 0393020258. Piłsudski, Józef. Pisma zbiorowe. (original 1937) reprinted by Warszawa: Krajowa Agencja Wydawnicza, 1991. ISBN 8303030590. Watt, Richard M. Bitter Glory: Poland and Its Fate, 1918–1939. New York: Hippocrene Books, 1998, ISBN 0781806739. History of "Battle of Warsaw (1920)"
This page was last modified on 20 May 2016, at 22:24.